The unemployment rate in the United States for the month of March 2018, remains unchanged at 4.1%. There has been no change in the unemployment rate since October 2017. However, in the month of March, the total nonfarm payroll employment increased by 103,000. There has been a significant increase in employment in industries such as construction, retail trade, professional and business services, manufacturing, financial activities, and mining. March is the sixth consecutive month with the unemployment rate has remained at 4.1%, with the number of unemployed persons staying relatively unchanged at 6.7 million. In terms of the major work groups, the unemployment rate for the blacks declined to 6.9% in March. Out of the unemployed demographic Adult men (3.7 percent), Adult Women (3.7 percent), Teenagers (13.5 percent) Showed no change from previous months. The same can be said for The Whites (3.6 percent), Asians (3.1 percent), and Hispanics (5.1 percent). The number of long-term unemployed persons (People who haven’t been employed for more than 27 weeks) also remained relatively unchanged at 1.4 million. The long-term unemployed consisted of 20.3 % of the total number of unemployed people. The total number of nonfarm employment had increased by 103,000 in March with an overall of 326,000 jobs. There was a significant rise in jobs in the manufacturing, health and mining industries. goods component accounted for about three-fourths of the jobs added. March also saw a rise in jobs in the healthcare industry. The month saw 22,000 jobs added in the industry. Employment trended up mostly in the ambulatory health care services (+16,000) and hospitals (+10,000). The Mining industry saw an increase of 9000 jobs, with gains occurring in support activities for mining (+6000) and in oil and gas extraction (+2000). Employment in the mining industry has risen by 78,000 since October 2016. In terms of Professional and Business industries, March saw an uptick in jobs by 33,000 and has risen by 502,000 jobs over the year. March saw little change in Retail trade employment with -4000, following the increase to 47,000 jobs in February. 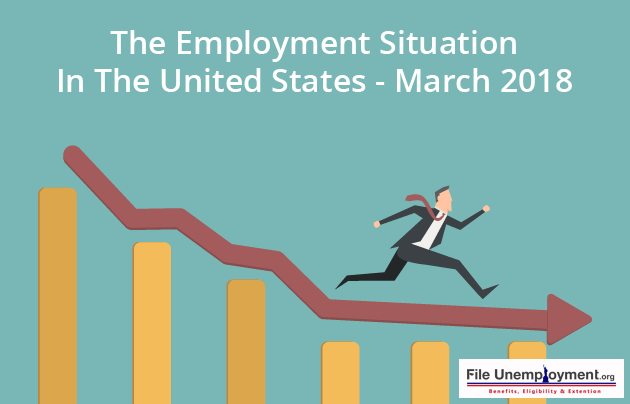 March observed a decline in employment by 13,000 in general merchandise stores. This decline, in turn, offsets the gain of a similar number of jobs created in February. With all the shift in jobs, over the year the retail trade industry depicts little net change. The Construction industry also saw a decline in jobs (-15,000) following up from the large gain of 65,000 jobs in February. There was little change in employment over the month in other major industries, which include wholesale trade, transportation, and warehousing, information, financial activities, leisure and hospitality as well as government.